“What is SSC NR ?” Staff Selection Commission is the central level agency which is responsible to recruit candidate in its various region. There are total 8 region in which SSC conducts its recruitment. The list of these region are SSCNR, SSC-CR, SSCER, SSCNER, SSCWR, SSCSR, SSCKKR, SSCNWR. Recently it has announced recruitment in Staff Selection North Region which belongs to New Delhi. Candidates who are willing to apply 200 vacancies can check the below mentioned details carefully. For More details How to Apply For SSCNR Recruitment 2017 ?. Fresh Update (30.08.2017) : Dear Applicants, Staff Selection Commission has recently issued Exam Syllabus for SSC North Region Vacancy. Applicants who are preparing for Examination can check SSCNR Exam Syllabus from here by clicking on below link. Who can apply For SSC NR Vacancy ? What is Eligibility Criteria For SSSNR Recruitment 2017 ? What are the age limits and age relaxations for examinations conducted by SSC? How to Select of SSCNR Group B & C Jobs 2017 ? | What is Exam Syllabus & Exam Pattern ? What is the scheme of examinations conducted by the SSC ? How to Apply For SSCNR Recruitment 2017 Application Form ? What are the Name & No. of posts for which the SSC conducts exams ? How you get Salary After Joining the SSCNR Jobs ? NR21517 Research Assistant (Environment) 03 (OBC – 02 & SC – 01) Level-6 in the Pay Matrix, Rs. 35,400-1,12,400/- (G.P. NR21617 Research Investigator (Forestry) 01 (OBC – 01) Level-6 in the Pay Matrix, Rs. 35,400-1, 12,400/- (G.P. SSC NR Vacancy what are the required qualifications? Candidate should have the qualifications like 10th pass, Bachelor’s degree, Master’s degree, Certificate/Diploma, Degree of Bachelor of Science from an recognized institution of the sate For post wise details of the educational qualifications read the SSCNR Recruitment 2017. For more details visit here. Age relaxation in upper age for SSC NR Vacancy 2017 is applicable up to 05 years only for reserved category candidates. Candidate should check upper & lower age limit for UR category candidate. SSCNR Recruitment Post Wise Age limit should be given below. For Post 3 to 8, 11 to 17, 19, 21 & 24 to 27 : Candidate age should be in between 18 to 30 years. Vacancy of SSCNR For Post 09, 18, 22 & 23 : Candidate age should be in between 18 to 27 years. 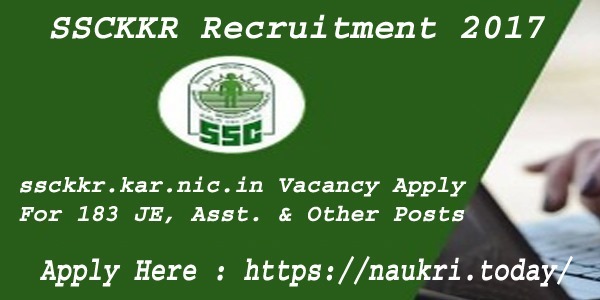 SSC North Region Recruitment For Post 01, 02, 10 & 20 : Candidate age should be in between 18 years to 25 years. Candidate should have Pay Rs. 100/- for Pay fee through “SBI Net-Banking/Credit Cards/Debit Cards” or through SBI Callan. It will be accepted online modes only. “Which category of candidates is exempted from examination fees for exams?” All Female candidate/ SC/ ST/ PWD/ Ex-Servicemen will not be having pay any application fee for SSCNR Recruitment. Selection Process For SSCNR Vacancy 2017 : Candidates who wish to take part in the SSC North Region Recruitment 2017 need to face OMR/ Computer Based Written Exam & Personal Interview. Candidates will be selected in written exam then they call for Interview. The Staff Selection Commission selection process will held through SSCNR Examination and personality Test or Interview. In this Computer Based Exam consists of Objective/ Multiple Choice Question. Total no. of question 100 & total Marks 200. There are Four Subject i.e. General Intelligence, English Language (Basic Knowledge), Quantitative Aptitude (Basic Arithmetic Skill) & General Awareness. SSCNR Syllabus & Exam Pattern will be provided at the official portal of the organization. So collect the respective details form the SSC Online Exam portal and prepare to the examination. We are provide here for all the query which is putted by Candidates who are interested in this SSC exam. What is Instructions for Registration of SSCNR Application Form ? How to Apply For SSC NR Group B & C Jobs ? etc. Visit the official site of the Organization i.e www.ssconline.nic.in. Then the candidates need to read the SSCNR Notification. If applicants are eligibility to apply for this SSCNR Recruitment 2017. Then Fill the SSCNR Application Form 2017 by the step-by-step process. Finally after submission take an hard copy of this application form. Note Down Registration No. & Password for future use. 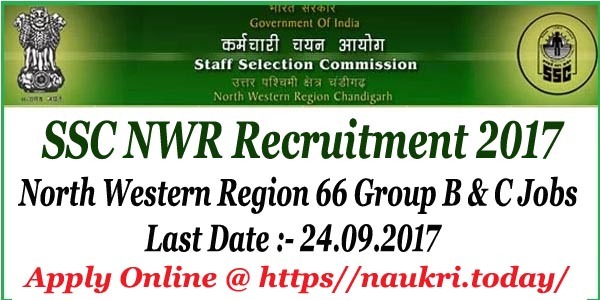 Conclusion SSCNR Recruitment 2017: Staff Selection Commission has released SSCNR notification for 244 Group B & C Post. Eligible & Interested candidate can apply in between 25th August 2017 to 24th September 2017. In this article, all are give the details related to SSC North Region Recruitment 2017. Please email se information dedo.